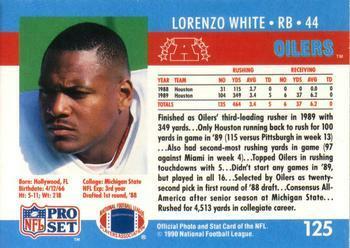 Lorenzo White - (born April 12, 1966) is a former professional American football player who was selected by the Houston Oilers in the 1st round (22nd overall) of the 1988 NFL Draft. He attended Dillard High School in Ft. Lauderdale in Florida. A 5 ft 11 in running back from Michigan State University, White played in 8 NFL seasons from 1988 to 1995. His best year as a pro came during the 1992 season with the Oilers, rushing for 1,226 yards and 7 touchdowns. He was also selected to play in the Pro Bowl that year. White was nationally known as the "Great White Hope from the Green and White". At Michigan State, White became the first Big Ten Conference running back to compile a 2000-yard season when he had 2,066 yards rushing on 419 attempts during the 1985 NCAA Division I-A football season. As a Senior at Michigan State, he ran for 1,572 yards and 16 TD. The yards were second to Jamie Morris of Michigan while he led the Big Ten in rushing attempts and rushing TDs.